WATERLOO – Wilfrid Laurier University’s Robert Langen Art Gallery (RLAG) will host its fifth annual Empty Bowls charity event on the university’s Waterloo campus Thursday, May 14, 2015. Empty Bowls is a long-running annual fundraiser for The Food Bank of Waterloo Region, spearheaded by the Waterloo Potters' Workshop. In celebration of the fifth anniversary, members of the Waterloo Potters' Workshop have created 125 bowls for this sold-out Laurier event. The gallery staff has also secured a dozen exciting silent auction items, including a private pottery workshop with artist Rosemary Startek, Shaw festival tickets, Gina’s Spa gift basket, a Relish cooking class, among others. Both the bowls and silent auction items will be on display in the Robert Langen Art Gallery from May 11-13, from noon to 5 p.m. The Robert Langen Art Gallery has played a vital role at Wilfrid Laurier University’s Waterloo campus since it opened in 1989. 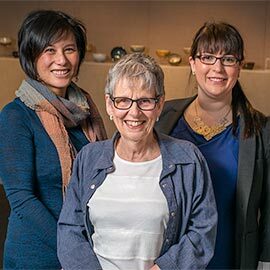 As Laurier’s visual arts centre, the Robert Langen Art Gallery provides knowledge, stewardship, appreciation and enjoyment of Canadian art and culture to members of the Laurier community and beyond. The gallery’s annual programming complements concepts and theories in Laurier’s academic curriculum and integrates community outreach initiatives as related to the visual arts. Tickets for the event are sold out. Media are welcome to attend.